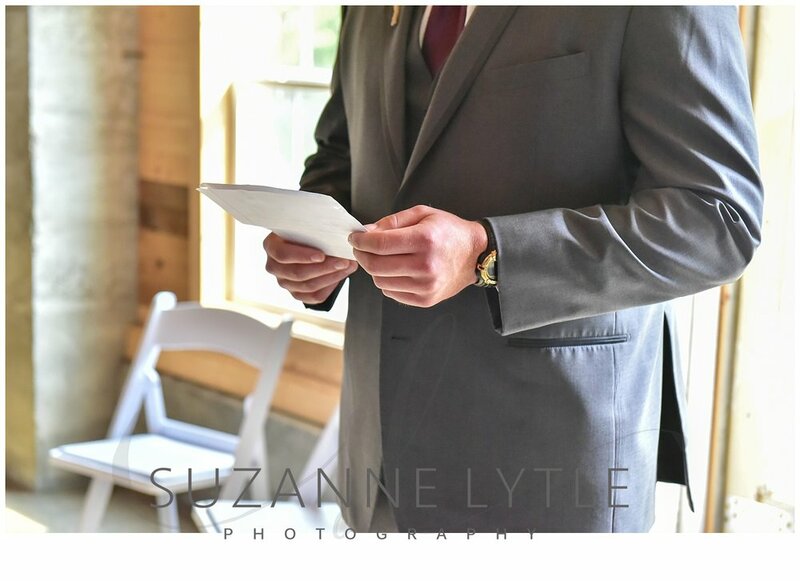 The wedding of Ashley & Cory held a lot of meaning for me. I have known the bride Ashley, since she was a young girl in Girl Scouts. Being in someone’s life, and watching them grow into a beautiful, capable woman is amazing enough. But being able to photograph their wedding? Gosh! Let me tell you, I was emotional! I flew in from Florida expecting a cool fall day in Michigan. And wishing to leave the heat behind, or so I thought. The wedding day started out comfortable in the low 70s but soon skyrocketed higher. Despite the rising temps, their wedding day was absolutely fabulous! Ashley just graduated from nursing school, and Cory is currently enrolled in the Academy to become a Michigan State Trooper. Talk about ambition! And I found out that the couple had not seen one another for six whole weeks prior to their wedding! The ceremony and reception was held at The Grand Belle in Holly, Michigan. 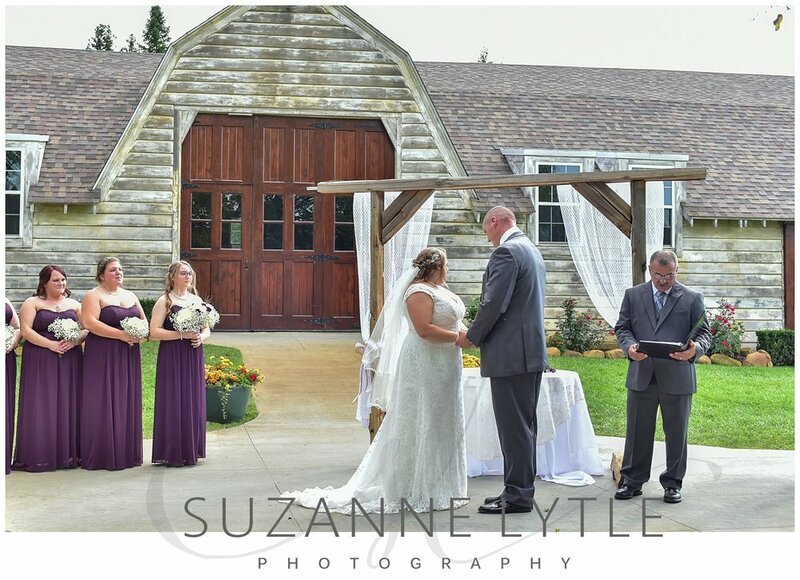 Which is a cool, vintage barn on gorgeous grounds. Every detail showcases its architecture and history. Upstairs is a heavenly bridal suite, furnished with an eclectic mix of vintage and shabby chic elements. Natural light streams through the large windows, and bathes the room in a wonderful glow. The old storage cellar under the barn has been turned into a charming area for guests to enjoy appetizers and access the grounds. Outside, yard games and cozy sitting areas welcome guests to stop and enjoy their surroundings. Ashley wore a vintage inspired gown, and her bridesmaids wore deep purple. 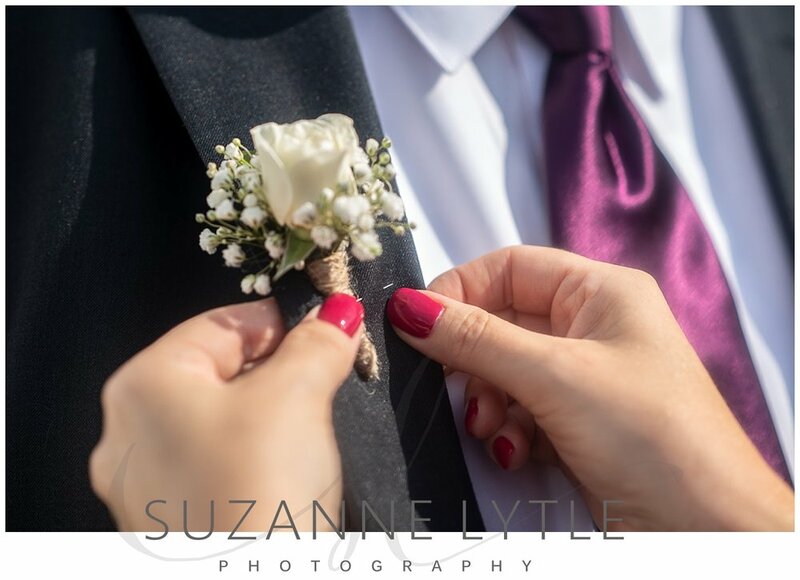 The groomsmen looked absolutely handsome in their gray suits with purple accents. 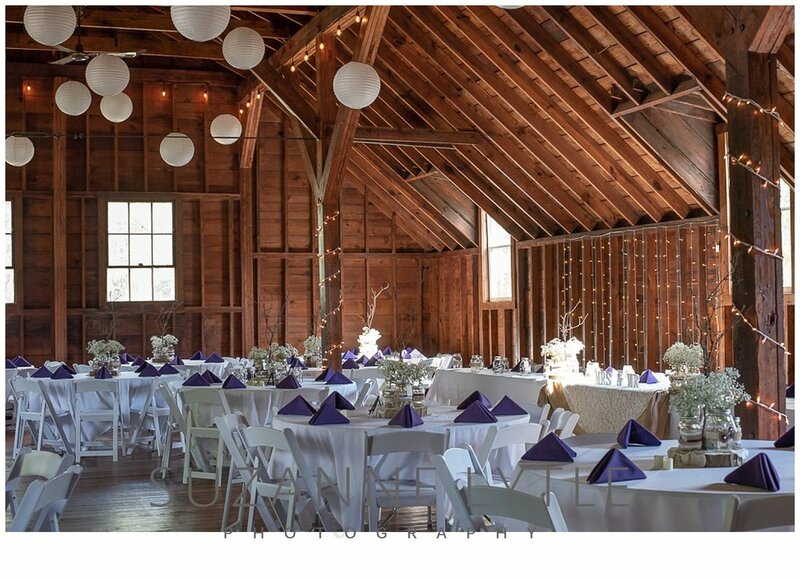 Adorable handmade decor accented the barn and tables. Mason jars adorned with burlap and pearls graced each table. Each centerpiece was created by guests at Ashley’s bridal shower. How clever is that? Pearls played a large part in Ashley’s decor, as she earned her Gold Award in Girl Scouts and “Pearl” is Juliette Gordon Low’s nickname—the woman whom founded the Girl Scout movement. Once a Girl Scout, always a Girl Scout. Both Ashley and Cory are dedicating their lives to serving others, and their passion for making the world a better place through their actions shows in all they do! Congratulations Ashley & Cory. Wishing you many years of happiness and adventure!